structures. And with its easy application and outstanding durability it’s the ideal choice for those who demand speed,quality and aesthetic appeal. When working with masonry products like concrete and stucco it is important to finish the surfacing with a waterproofing membrane. Water proofing membranes are often applied to home foundations, but can be applied to many other surfaces like patios and balconies. 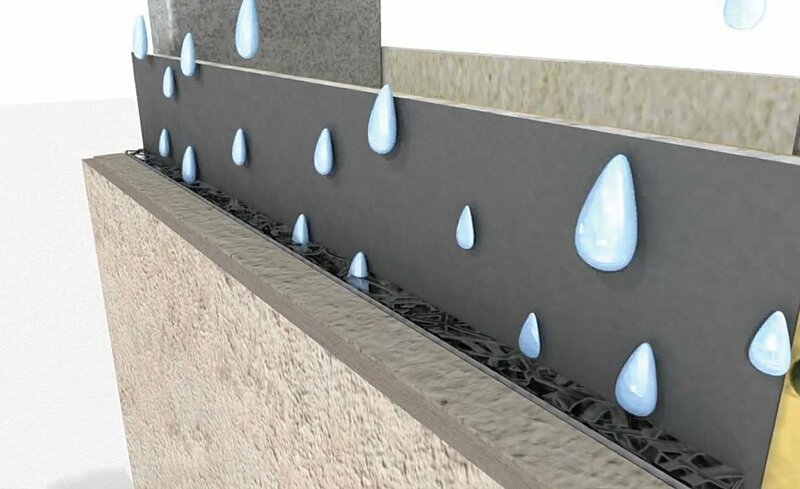 A quality masonry waterproofing product will provide a slip-resistant, breathable finish, that is able to prevent water intrusion. Water intrusion can cause many problems for homeowners ranging from cosmetic to structural. Some of these potential issues include hairline cracks in stucco work, cracking or crumbling sidewalks, or lifting concrete pavers. The cost of these problems greatly exceeds the cost of applying a coating of waterproofing membrane over the finished masonry project. Working with liquid waterproofing membranes for masonry projects is as easy as it is important. 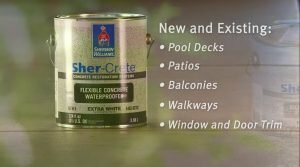 One such product is Sher-Crete® Flexible Concrete Waterproofer by Sherwin Williams. To install Sher-Crete® Flexible Concrete Waterproofer it is recommended to apply two coats of product to the surface. Sher-Crete® Flexible Concrete Waterproofer is dry to the touch after just one hour, allowing four hours between coats and allowing 24-hours before walking on the affected masonry. A typical gallon of Sher-Crete® Flexible Concrete Waterproofer will cover roughly 125 to 150 square feet depending on how porous the applied surface is. Waterproofing membranes can be applied by brush, roller, or sprayer. It is recommended that waterproofing membranes to be applied at temperatures between 50˚F and 100˚F for optimal results. Sher-Crete® Flexible Concrete Waterproofer by Sherwin Williams has another distinct advantage, in being tint-able. You can choose to have Sher-Crete® Flexible Concrete Waterproofer tinted to one of hundreds of colors, or leave it transparent for a more natural finish to your masonry project.